It is important to generate backups of your website regularly. This way, if something goes wrong on your website, you will always have a working copy that can be restored. The backup creation is a process that involves two main steps. The first thing to do is to create a backup of the files of your Concrete5 website. This can be easily completed using your favorite FTP client. The important thing here is to locate the exact directory of your Concrete5 website. If you are accessing your website directly by entering your domain in the web browser, this indicates that the Concrete5 website is located within the public_html/ directory of your website. However, if you are accessing it via a subfolder, this means that you will find such a folder within the public_html/ directory. Once you locate the directory containing all of your Concrete5 files, simply download the entire folder to your local computer. There are two ways of downloading your files to the server - using an FTP client, following our FTP tutorial, or downloading directly through your cPanel account > File Manager, following our cPanel tutorial. To create a backup of your database, you need to see it's exact name first. You can review that information via the main configuration file of your Concrete5 website. Once you find the database set on your Concrete5 website, you need to log into your cPanel account. Locate and navigate to the Databases tab and then access the phpMyAdmin service. 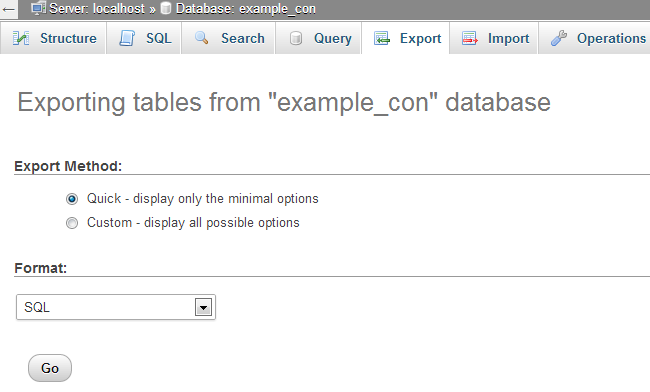 Select the database of your Concrete5 website from the list on the left-side of the screen.